Just very very slowly. 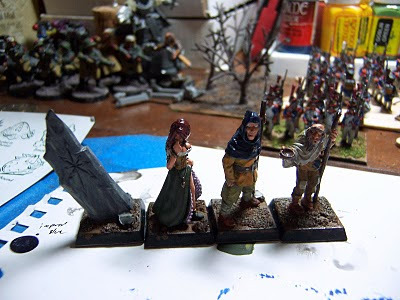 Shown here are a rune stone (from the stone in the WHFB giant's hand), and the three reaper townsfolk figures I talked about previously. Sorry about the crappy picture, I used my old camera with no prep. Still need to repaint the base edges, a few highlights, and then dullcoat. Plus flock, etc. So, only about 70% done, really. In the background we have a wood, neo-soviets, and 15mm French. I have been planning on creating a Copplestone Neo-Soviet platoon for a while (for use in Star Grunt II), but have somehow resisted the urge to buy miniatures for future projects. And now I see that Copplestone has a platoon on offer for £62... that is around $2.4 per figure (in metal!). The figures are not exactly what I would pick, but golly if it is not tempting. First of all, welcome to Jim & Jody, new follower(s) of this blog. Hopefully you find some interesting posts. Second, thinking a bit about the role of the cleric in classic D&D games. I had a very vivid dream last night that featured children's books, the title of one of which was St. Sebastian and the Water of Life. Not knowing anything about St. Sebastian, I of course headed to Wikipedia. That lead me to reading about military saints. If you think about it, a religious person would be pretty common in a dark ages type setting, particularly if you count those who merely labor as lay persons for the church. Priests would be slightly less common, and true clerics in the D&D sense, who can cast "spells", or otherwise more directly interact with a deity would be uncommon indeed. This person might be seen as a sort of military saint, someone who was/is a military person, but has a religious calling as well. 1 leveled (spell casting) cleric per 1000 people. Which seems to be pretty reasonable. In some eras, you could say that there is a crisis of faith, or if an enemy of the deity is active, and modify the numbers to suit. Not every cleric is going to be a saint (indeed in true OSR games, most will be martyrs), but those that get up higher in levels would be seen that way by believers, and it seems like they would become famous later as well. Always on the lookout for a set of rules to refight Greek city state wars, I noticed that Rick Priestley, recently of Games Workshop, talks here a bit about the upcoming adaption of the Black Powder rules for ancients gaming. Not sure that I like multiple figures on one base, but it does create a good look... and I have used regimental bases in Warhammer (20x80mm). Games without figure removal are also a bit odd to me, even Warmaster allows for base removal. Anyway, something to keep an eye on for 28mm ancients...however sensible it would be to go for 10mm and Warmaster instead. Back in the summer, I was thinking quite a bit about running a WHFRP sandbox game, as mentioned in this post. During that time, I was reading the Bat in the Attic blog quite a bit, and came across the term "Old School Renaissance" (OSR). The OSR and D&D has become my obsession de'jour after I had a flash of inspiration on the way home from work one day. I was thinking about something else entirely, and suddenly, I started thinking about a dark age pseudo-European setting suitable for dungeon delving. (decaying empires, howling barbarians, and all the usual accouterments) Now I think about it obsessively, and read tons of blog posts about games, rules variations, items, metagame concerns, and so on. Some material has even be cribbed for future use. (Google docs is very helpful in that regard) Not helping matters is that I got Baldur's Gate for Christmas (only 12 years behind the times), and now D&D subsumes most other hobby thought. Figurewise (every game must have figures), I have been looking at Perry First Crusade for the humans (such as these chaps for thieves), Hasslefree for dwarves (these fellows), and am a bit stumped for elves. I made a post on the Lead Adventure Forum seeking advice, and game away with a few options to try. The Thunderbolt Mountain elves may be perfect, although they tend to scale armor instead of mail, and like many Tom Meier sculpts, look a bit "dead" (the uncanny valley at work?). So anyway, that is the OSR, and my D&D obsession. Sometime I hope to post more about the setting, and Lord forefend, something about playing a game or painting miniatures. First off, Merry Christmas and a Happy New Year to you and yours. Sort of late, but there you have it. As you might recall, way back in mid January of last year, I made five resolutions for 2010. 1. Get in a Game or two: Complete failure if you count only miniatures games. 2. Paint More Figures: Complete failure. I have painted a mere two figures, and put a few layers of paint on some others. Nearly made it a whole year without painting a single figure. 3. Figure out Figure Storage: Partial failure. Have spent way too much time looking at plastic boxes, trying to find the "perfect" one. Decided that a 4" high box would be ideal. 4. Get Hobby Room Finished and Set Up: Pass. Room is still full of in-laws, therefore can not be set up. Hopefully will be empty in 2011. 5. Use airbrush again: Complete Failure. Did not finish building the Baneblade, and therefore did not use the airbrush to paint it. Well, that is somewhat depressing. In my defense, we did have an addition to our family, which has absorbed 90% of formerly free time. I think that for 2011, I will just try to accomplish the 2010 resolutions. I have started painting again, so hopefully at least #2 will be accomplished. In other gaming related news, we gave some Friends of ours Puerto Rico as a Christmas gift, and were able to get a couple of games in. Pretty fun, although it is component heavy. I did not win either game, but I did come in second the second time we played, and as usual with new games, acted as rules reader and arbitrator. I asked my wife if we should get the game for ourselves, and she was quick to say no, not that she did not enjoy the game, but due to the number of pieces, and the likelihood of the offspring consuming them.